Jordan borders Saudi Arabia to the east and south-east, Iraq to the north-east, Syria to the north and Israel to the west, sharing control of the Dead Sea with the latter. Jordan’s only port is at its south-western tip, at the Gulf of Aqaba which is shared with Israel, Egypt, and Saudi Arabia. Over half of Jordan is covered by the Arabian Desert. The capital city is Amman. Modern Jordan was founded in 1921, and it was recognised by the League of Nations as a state under the British mandate in 1922 known as The Emirate of Transjordan. In 1946, Jordan became an independent sovereign state officially known as the Hashemite Kingdom of Transjordan. After capturing the West Bank area of Cisjordan during the 1948-48 war with Israel, Abdullah I took the title, King of Jordan and he officially changed the country’s name to the Hashemite Kingdom of Jordan in April 1949. Jordan itself is a country steeped in history and natural beauties. 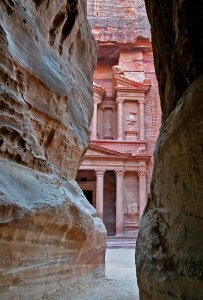 A list of what you can find in Jordan is a like a tick list of history and places you’d like to go one day. The most complete Roman city in the World, the lowest point on earth, the Dead Sea, the place Moses pointed out the promised lands, where Jesus and John the Baptist were baptized, where the crusader built huge forts and where Salah Ad-Din (Saladin) defeated them. Jordan was the link between the trading blocs of northern Egypt and Damascus and where the Nabateans controlled this trade route and built amazing cities, none more famous than Petra. An amazing city carved into the rock and protected by extreme terrain and secret routes in/out which was lost to the world thousands of years ago and though the Bedu people knew where it was, the west did not find it again till 1812, 200 years ago this year. Since then it has become a world famous site, one of the new Seven Wonders of the World and, of course, where Indiana Jones went in search of the Holy Grail! Jordan is home to the Bedu people, who live their lives wandering the vast deserts, “the ships of the desert”, the camels that carry them places, (though many these days are seen being carried by people in the back seat of their cars (for real! )), and of course the majestic Arab horse, an animal more famous than any in Equine circles. And in the south of the country is the mazing landscape, best known as Wadi Rum, though the area itself is huge, Rum is just one part of it. This is where the rolling desert sand dunes meet the sandstone cliffs, which tower hundreds of feet high from the sandy floor. A truly spectacular place, made famous in the epic movie Lawrence of Arabia.